Shortly before the team issued its statement, Warriors owner Joe Lacob was asked about a potential White House visit during an interview with ESPN's "First Take." "I can't believe we're getting this question already," Lacob said. "But honestly, that's something we'll worry about at the time. That's a long time from now." Original Story: Whether you agree with an American president or not, wouldn’t you meet them if given the chance? Apparently not, as reports have surfaced that the newly crowned NBA champions, the Golden State Warriors, have allegedly decided “unanimously” to boycott the customary champion’s visit to the White House. The boycott, if proven to be true, wouldn’t be surprising, considering some past comments about Trump from a few Golden State players. Power forward David West took time to not only voice his displeasure of a Trump presidency back in November, but also to disparage Trump supporters. The things that he said, the things that he represented, that’s the way that the majority of this nation feels. I think he just emboldened them because he’s able to say it publicly. He got the platform. It is kind of unnerving and unsettling. … The man’s 70 years old, so he is who he is. It’s just a shame that, throughout the process, a lot of these people were in hiding and waited for the cover of the ballot to represent who they are. Steph Curry, one of the team's star players, vehemently disagreed with Under Armor CEO Kevin Plank after Plank stated that Trump would be a “real asset” to American businesses. 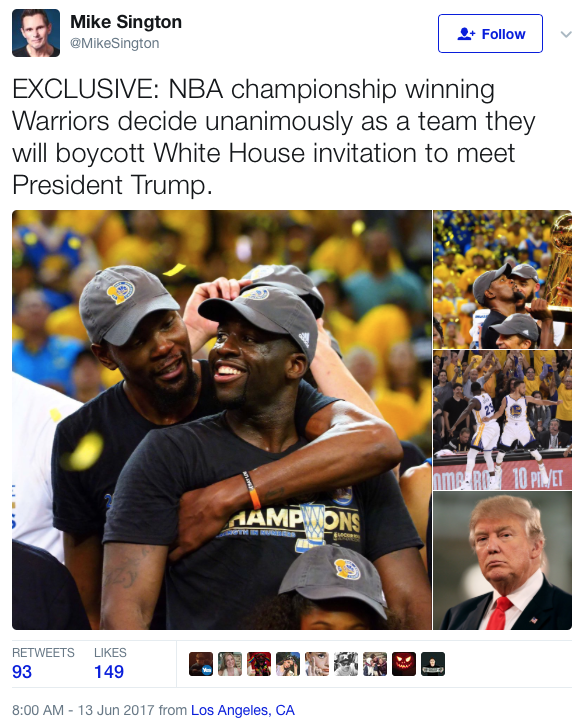 If the rumor of the team boycotting their White House visit turns out to be true, Golden State might want to think about changing their name to the “Social Justice” Warriors.